Our entire state faces uncertainty and vulnerability when it comes to water use and supply. 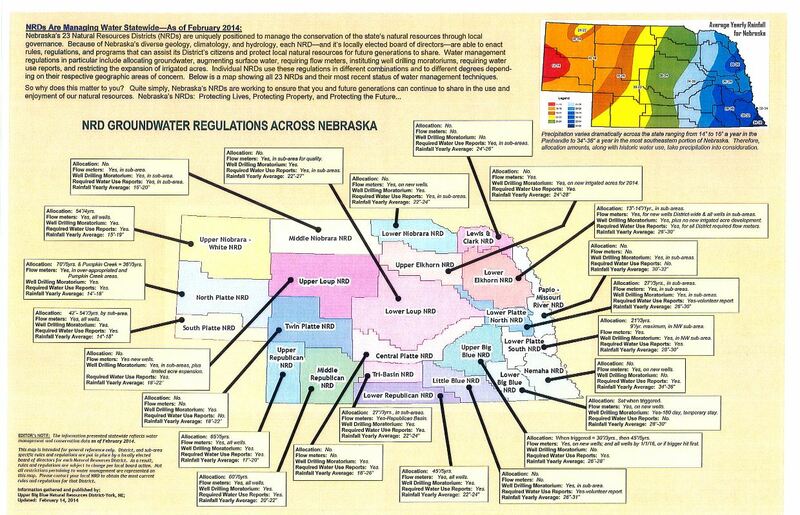 Nebraska’s cities and towns, our agriculture industry, and the business sector all require water, but the demand for water will soon outpace the water available for these needs. 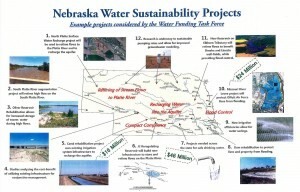 Recent droughts have depleted the renewable water supply in Nebraska. Water decline affects communities that rely on agriculture, school districts that rely on a tax base the benefits from the value of irrigated land and the citizens of our state. 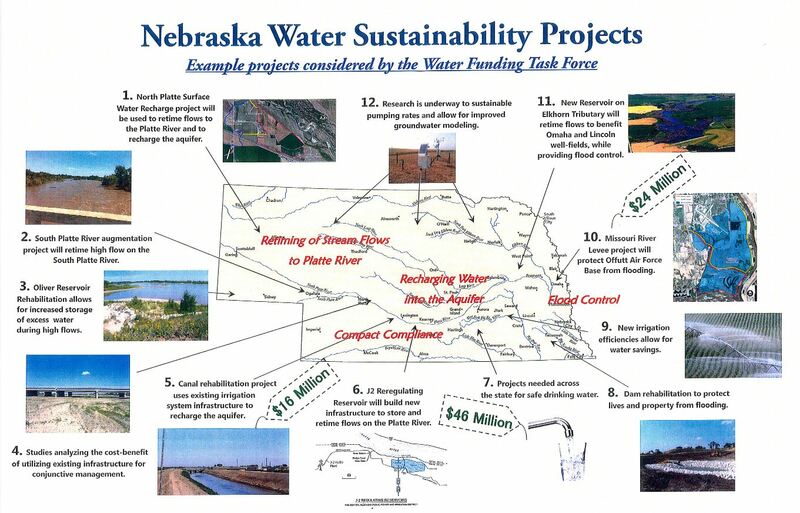 In order to address these imperative issues and create and FUND innovative solutions, the Nebraska Water Funding Task Force recommends an annual funding amount of $50 million. A $50 million appropriation will help to fund projects in each of these KEY areas. Most water sustainability projects have multiple benefits and fall into more than one of the following categories. 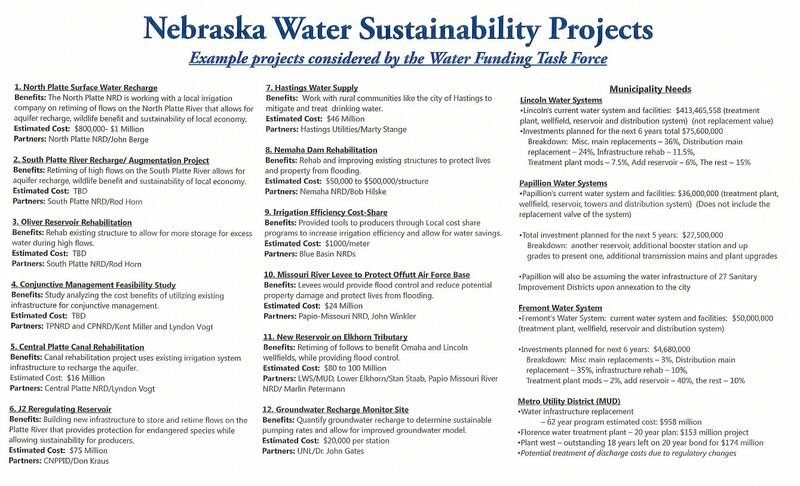 However, each category serves an important role for the future of our state’s water sustainability. Our governing entities need to be able to do better planning on a basin by basin and statewide basis so that funding can be focused on the greatest needs. Research, studies and models are vital for the most accurate and defensible planning. Aging infrastructure is a statewide problem – dams, irrigation, hydropower facilities, urban water supply and disposal systems are examples of what needs work. The state must support the groundwater management and integrated management efforts of the Department of Natural Resources and the natural resources districts if we want such management to be successful. Research, updating infrastructure, and integrated management all either directly or indirectly will help the state stay in compliance with our legal obligations. Acting on its charge in LB 517, the Water Funding Task Force reviewed potential water sustainability projects to determine a scale of the need and of the magnitude of the water-related challenges that lay ahead as we look to the future of our state. 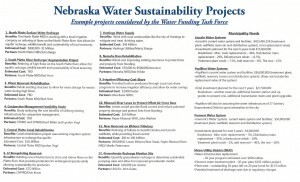 Nebraska municipalities have identified 81 Water Quality Projects – including removing nitrates and addressing arsenic problems that will cost nearly $144 million. A 2012 report by the University of Florida listed Lincoln as the third-most at risk city for water shortage. Projects must be identified to sustain the flow of the Platte River to protect Lincoln’s well fields. 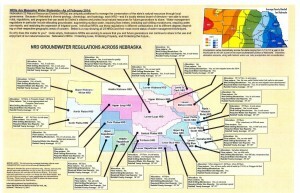 The Omaha World Herald reported on February 6, 2014 that 100 to 150 domestic wells went dry in 2012 in the Lower Elkhorn Natural Resources District. Projects and programs must be put in place to ensure domestic wells are able to continue producing water. Natural Resources Districts and Irrigation Districts need State Partnership on infrastructure and projects developed through integrated Management Plans to ensure compliance with state compacts and agreements. Estimated costs for these projects top $314 million. Money is needed to implement projects with multiple benefits, including ensuring clean supply of municipal water, flood control, and aquifer recharge. Water users need money to conduct studies, modeling, and research to determine the most appropriate tools and resources to ensure water sustainability in our state. Leveraged with a required local match (as recommended by the Water Funding Task Force) – a $50 million dollar appropriation will make an important impact on our future water supply.